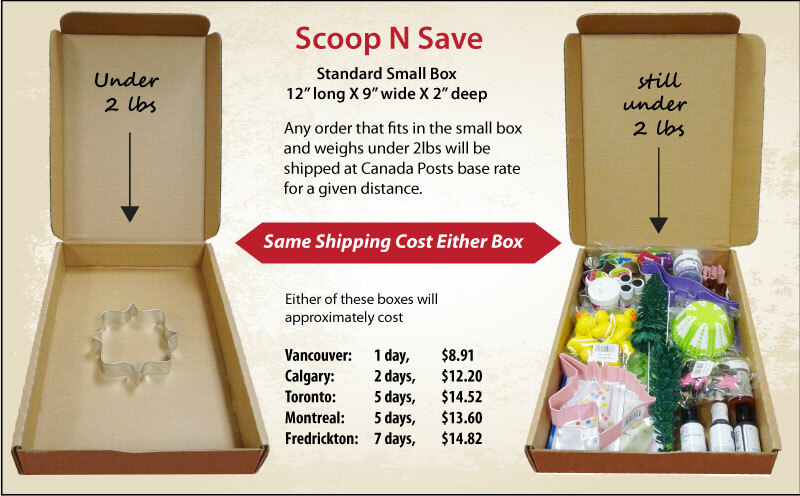 The shipping services that are available with Scoop-N-Save are Canada Post Regular, Canada Post Expedited and In -Store Pickup.You will be shown the choices and costs of shipping when you proceed to the checkout. How quickly is your order processed ? We strive to make sure that any orders placed during business hours before 2:00 pm PST are shipped that day. Business Days are Monday – Friday, excluding weekends and holidays. Any orders placed after 2:00 pm PST will be processed the following business day. However, times can vary depending on current volume and seasonal demand. 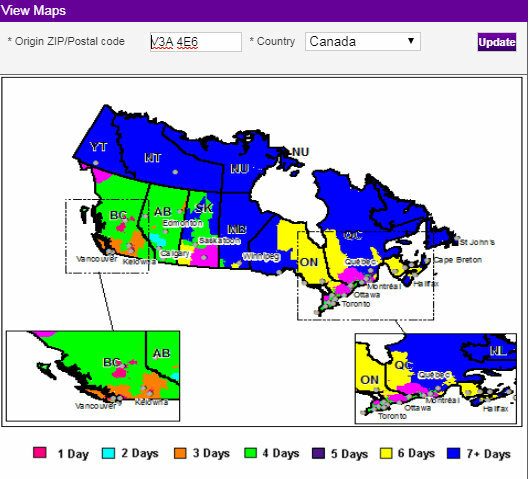 At this time we ship across Canada and the United States. 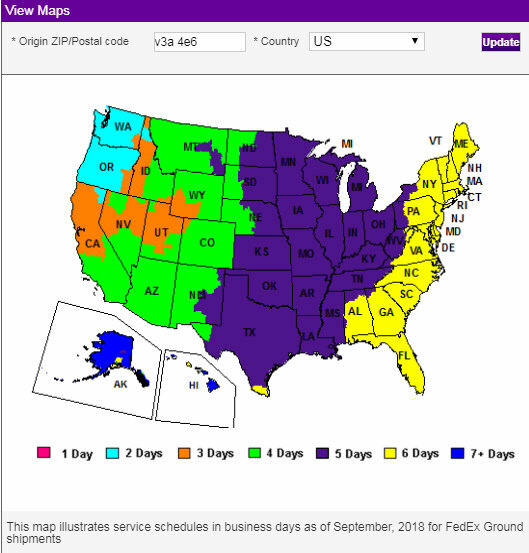 What are the transit times and shipping costs? Shipping costs are calculated live and are specific to your orders weight, size dimensions and postal code. Costs vary from province to province and once you've entered your shipping address it will then allow you different choices for shipping costs. Ground orders received will go out the following business day - which are Monday - Friday, excluding holidays. Express orders received by 12:30 pm will go out the same business day - which are Monday - Friday, excluding holidays. Any orders received after this will go out the next business day. Please Refer to this guide for the transit times determined by your postal code: Transit Guide . 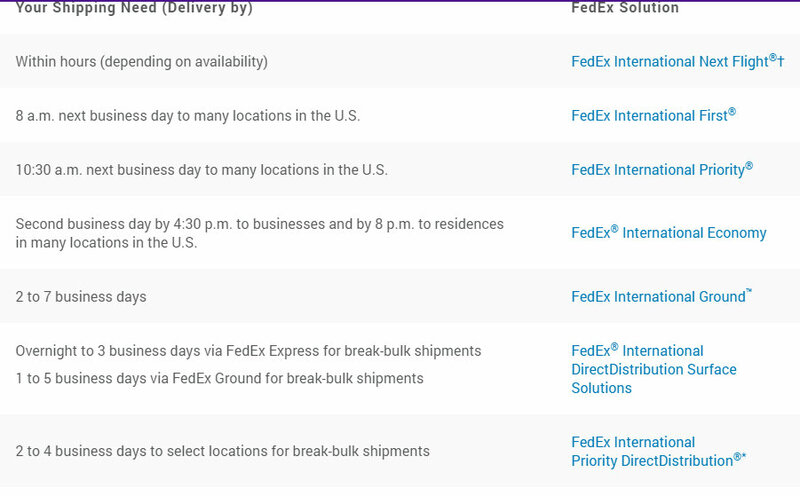 This will not reflect the shipping rates that you will receive but the transit times only. You will be notified by e-mail when your order has shipped. This e-mail will include your tracking number. You will be able to use the Canada Post website to track your order. We do our very best to get your product(s) to you safely and in a timely manner. Please note that if you choose Small Packet International Air this will not be a tracked parcel and therefore we will not be responsible for lost, stolen or misplaced packages. We have no recourse unless you chose to ship Tracked Package International then you will be given a tracking number but the cost is significantly higher for this service. You will be given a choice in the shipping detail section of your order. How do “In-Store” Pickups work? When checking out you can choose the “ In-Store Pickup" option instead of entering a delivery address. Any order placed before 9:00am can be picked up after 2:00 pm that same day ( excluding weekends and holidays ) Any order placed after 9:00am will be made available after 2:00 pm the next business day. Depending on the demand of orders that are made it will be the discretion of Scoop-N-Save to have your order ready sooner. You will receive an email when your order is ready. We will not be held responsible for incorrect/incomplete email address' given. Orders must be paid for online only. Customers must bring their email receipt to claim their order. Once you have selected "In-Store" pickup, you are responsible for claiming your order from the store within 10 business days. If you have not claimed your order in this allotted time frame we will refund your order back to you minus a 15% restocking fee. Once this option has been chosen - arrangements cannot be made to have your order shipped and it will be your sole responsibility to collect your parcel. Orders cannot be picked up on Sundays, Stat holidays or any other regular store closures. No special arrangements can be made to pick up orders after hours. If I am not satisfied, can I return my order? No returns will be authorized without prior agreement of a Scoop-N-Save staff member. Notice of any defective or damaged goods must be given to Scoop-N-Save within 24 hours of receiving the shipment. Notice may be given over the phone or by e-mail. Scoop-N-Save reserves the right to refuse returning goods. Returned goods must be in their original packaging. No returns will be permitted for any edible food products or wedding cake toppers. NO RETURNS ACCEPTED AFTER 15 DAYS! If you are unsatisfied with your order, please contact us via phone 604-533-0035 or sales@scoop-n-save.com to obtain authorization before returning any merchandise. All returns will be at the sender’s expense. Please ship your package with adequate insurance for the value of the contents. If your merchandise becomes lost or damaged while being returned, Scoop-N-Save Ltd, will not assume responsibility. You (the customer) are responsible for return shipping, brokerage fees, duties, and taxes (if applicable). Return shipments should be properly insured. Scoop-N-Save Ltd will not be held responsible for any loss, non-delivery or damage to the products during shipping. All merchandise returned should be in its original condition to facilitate or guarantee a return. Can I exchange my order for something else? The product I received doesn't exactly match the photo/description, can I return it or get a refund? As per our terms and conditions page, every effort is made to ensure product accuracy including size, colour and design are up-to-date, however due to several factors out of Scoop-N-Save's control, products may occasionally appear differently in person. Product elements can appear differently online from computer to computer and fluctuation will occur with the size, colour or general appearance of a product, refunds will not be issued in this case. If your product is damaged or discoloured then that is a separate matter. Any return requests must be made within 7 days of receiving your order. We will not accept any returned orders unless it has been approved by Scoop-N-Save and a re-stocking fee of 15% may apply. We will only accept unopened, sealed, and unused merchandise in its original package with the original receipt. Not all items are accepted for return, please see the list below. Please email sales@scoop-n-save.com or call the store during regular business hours at 604-533-0035 for approval. Each return/refund will be decided on an individual basis. It is the responsibility of you ( the customer ) to make sure that all address and contact information is correct prior to completing your order with us. If an order is returned to us due to an incorrect address by you ( the customer ) when you placed the original order we will re-ship your order at your expense. If you ( the customer ) decide not to re-ship the order, we will refund your order back to you minus the 15% restocking fee and the original shipping charges. Occasionally , we will run into a product that is out of stock but still available on our website. We do our best to make sure that doesn't happen often but if it does occur we will inform you by phone or email ASAP and we will either refund you the product or offer you a substitute.